A tiny amphibian takes center stage in the first case of October 2018 term. The dusky gopher frog is native to the forested wetlands of the southern coastal United States, with a historical range from the Mississippi River in Louisiana to the Mobile River delta in Alabama. The frog breeds in ephemeral ponds – ponds that are wet for brief periods and then dry out completely – and spends the rest of its life in upland, open-canopy forests, living in burrows created by other animals. Today, the only known remaining population of the dusky gopher frog lives on a single pond in Mississippi. In 2001, the U.S. 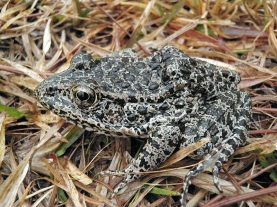 Fish and Wildlife Service declared the dusky gopher frog endangered under the Endangered Species Act. In 2012, the service designated the dusky gopher frog’s “critical habitat.” One of the areas the service designated is a parcel of 1,544 acres in St. Tammany Parish, Louisiana, which the service calls “Unit 1.” Weyerhaeuser Company owns a small portion of Unit 1 and leases the rest of the property from the other corporate owners, who are participating in this case as respondents. After Weyerhaeuser’s challenge to the critical-habitat designation of Unit 1 was rejected by the lower federal courts, the Supreme Court agreed to weigh in. The Endangered Species Act requires the service to list endangered species and designate their critical habitat. Section 3(5)(A) defines two types of critical habitat: areas occupied by the species at the time of listing and areas not occupied by the species at that time. Areas in the second category may be deemed critical habitat only “upon a determination by the [service] that such areas are essential for the conservation of the species.” The act defines “conservation” to include not only bare survival of the species, but recovery as well. A designation of critical habitat on private property has no direct regulatory consequence for the landowner. For the substantive restrictions of the ESA to take effect, there must be a separate federal action, such as a wetlands permitting process under the Clean Water Act. That federal action may neither jeopardize the continued existence of the endangered species nor destroy or adversely modify its critical habitat.